My last post about the thunderstorm in Alabama several years ago brought back other memories from the period of time during which we served with the Chisholm Hills church in Florence. Back then I was in a fairly regular exercise routine and would often work out at the YMCA after leaving the office. Not only was it beneficial for my health and fitness, it also provided a great “buffer zone” in which I could review and process the day’s activities, do some mental planning and preparation for the next day, and then be able to just focus on Kim and the kids when I arrived home. 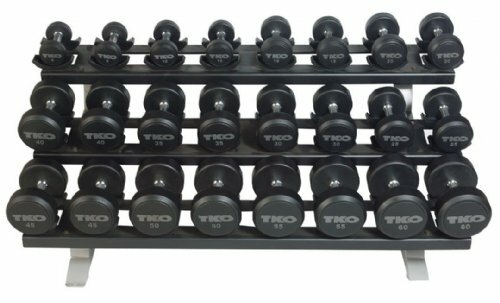 In the free weight area of the gym, there was a sign on the wall which read, “Please Put Dumbbells In Their Proper Place!” It was a pointed reminder for everyone to be courteous in their use of the equipment and to return the weights where they belonged. This ensured that subsequent users could easily find what they were looking for and kept the floor of the workout area free from hazards that could cause someone to trip and fall. Even though I completely understood the intent of the sign, I still couldn’t help but smile as I considered an alternative meaning and application. “Please Put Dumbbells In Their Proper Place!” Tempting, isn’t it? When someone says something to us or acts toward us in a way that is thoughtless, careless, hurtful, demeaning, insulting, or just plain “dumb,” there is a strong inclination to “put them in their place,” set things straight, and even the score. We instinctively want to defend ourselves and fire a volley in return, hurtful word for hurtful word, criticism for criticism, insult for insult, spiteful act for spiteful act. Jesus taught us to fight and overcome this urge and choose a higher road in our response. The “eye for eye and tooth for tooth” provision in the Law of Moses was intended to be judicial (administered by judges and the court of Israel) and restrictive (ensuring that punishment did not exceed the crime). However, it was frequently interpreted as personal and permissive: a license for individual vengeance and retribution in response to perceived wrongs and injustices. The result is an endless cycle of retributional one-upmanship in which the score is never mutually considered to be even. In such situations, there is no “even”; just ask the Hatfields and McCoys, Arabs and Israelis, the Sunni and the Shia. Jesus calls His disciples back to the Law’s intent and challenges us to “break the cycle” and refrain from returning injury with injury and insult with insult (Matthew 5:38-42). Paul wrote, “Bless those who persecute you; bless and do not curse…never pay back evil for evil to anyone…never take your own revenge, but leave room for the wrath of God…do not be overcome by evil, but overcome evil with good” (Romans 12:14-21). “When we are reviled, we bless; when we are persecuted, we endure; when we are slandered, we try to conciliate” (I Corinthians 4:12-13). Christ left an example for us to follow in His steps; “while being reviled, He did not revile in return; while suffering, He uttered no threats, but kept entrusting Himself to Him who judges righteously” (I Peter 2:21-23). Jesus calls us to a higher standard of thinking, speech, and behavior. It is not something that will come easily or naturally for us. It is a level of self-control that can only be produced by the Holy Spirit living within us (Galatians 5:22-23). It has to be a premeditated mindset of response to which we commit ourselves long before “the heat of the moment.” It’s not a matter of if we will ever have to deal with “dumbbells”; it’s only a matter of when. Tim – Thank you sooo much for helping me worship & understand God’s word. Although tragic, I fall into the trap of playing god all too often – doing what I like do. I loves me a whole lot of self-control. I know I’m unworthy and to think He pursued me (us) not holding back anything but giving it all up. What an Amazing God we serve! He is indeed an amazing God, Iona! Take encouragement, brother, that you are in the company of many (all of us!) who remain on the road to greater self-control; in reality, it has to be Spirit-control, because “self” is insufficient to accomplish the goal. Please greet Bernice and all the brothers and sisters in Honolulu for us!